The freshman forward from nearby Mesa is one of Utah’s most well-rounded players. 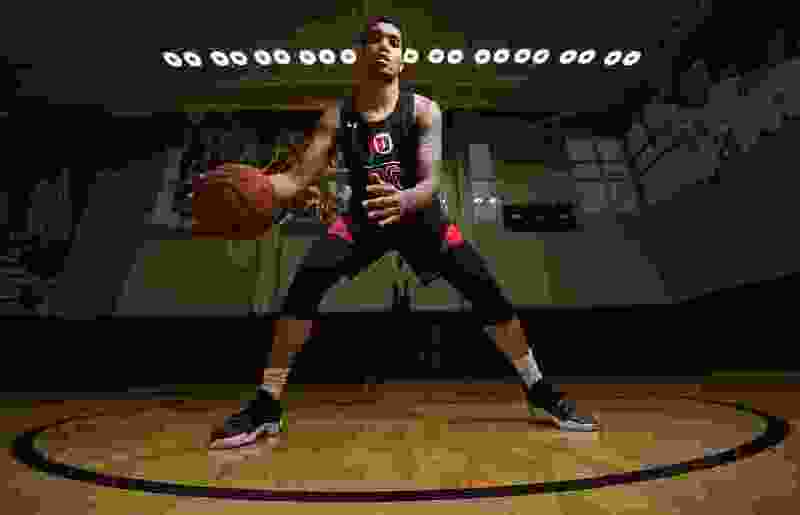 (Francisco Kjolseth | The Salt Lake Tribune) Timmy Allen is a Ute freshman basketball player, playing a big role for a young team. Tempe, Ariz. • The white van would hit Interstate 10 in Phoenix nearly weekend of the spring and summer, bound for California. That’s where Timmy Allen’s career blossomed in one of the country’s top AAU programs, enabling him to thrive as a University of Utah freshman forward. Ray Arvizu Jr. drove the van and steered Allen through those trying years when the teenager’s mother was dying of cancer. 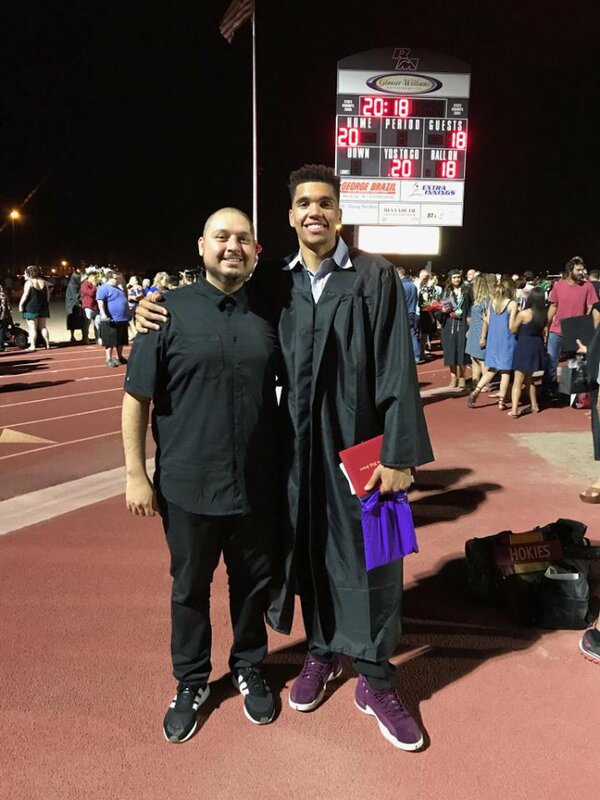 Arvizu became what labels a “brother, mentor, father figure,” influencing him during those six-hour drives for practices and games with the Compton Magic. That’s more of a compliment than it may appear. Allen ranks No. 2 on the team in assists (2.0), No. 3 in points (9.1) and No. 4 in rebounds (3.6). He’s among three freshman starters providing some hope for the Utes' future, during a season marked by the team’s inconsistency. Allen lived with Tim Ballantyne, his mother's longtime fiance and, in essence, his stepfather. He's part of a family that includes his two brothers (Nick and Teddy, who is redshirting in Wichita State's basketball program after transferring from West Virginia) and Ballantyne's three sons. (Photo courtesy of Ray Arvizu Jr.) Ray Arvizu Jr., left, is a mentor to Utah basketball player Timmy Allen, who graduated last spring from Red Mountain High School in Mesa, Ariz.
Allen attributes his accelerated youth to recognizing how his brothers “weren't as disciplined, [so] I just had to do what I was supposed to do and grow up,” he said, in an effort to reduce his mother's worries. “He’s always kind of had the maturity to make his own decisions,” said Arvizu, who said his role was simply to outline Allen’s choices along the way. Arvizu, 37, is the CEO of Mi Casa Su Casa, helping abused and neglected children through residential group care. Allen is close to Arvizu’s children, and Arvizu treats him like a son, visiting him in October to make sure Utah was a good fit, as Allen’s choice over UCLA, San Diego State, Iowa State and Texas Tech. “It was awesome to see him genuinely happy,” Arvizu said later. After his homecoming game at ASU, Allen and the Utes will go to Tucson for Saturday’s game vs. Arizona. They’ll travel down I-10 East, the opposite direction from those trips to California that helped him get where he’s going. Timmy Allen lays it in! At Wells Fargo Arena, Tempe, Ariz.
Records: Utah 6-6 (0-0 Pac-12); ASU 9-3 (0-0). Series history: Utah leads, 32-21. Last meeting: Utah 80, ASU 77 OT (2018). About the Utes: Sedrick Barefield’s tying 3-pointer forced overtime and the Utes upset a Top 25 ASU team in Tempe last January. … Barefield scored 33 points in Utah’s final nonconference game, an 86-71 loss to No. 6 Nevada. … The Utes are No. 49 offensively and No. 268 defensively in the kenpom.com efficiency rankings. … Utah will play at Arizona at noon Saturday. About the Sun Devils: ASU dropped out of the AP Top 25 after a one-point loss to Princeton last weekend, as they failed to follow up their upset of then-No. 1 Kansas. … Freshman guard Luguentz Dort has been a major discovery, averaging 18.1 points to lead four double-figures scorers. … Zylan Cheatham averages 10.1 rebounds.